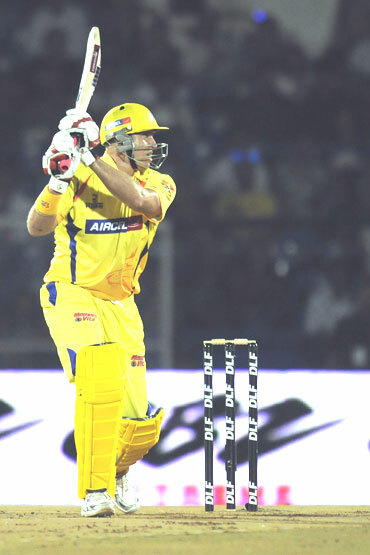 Chennia Super Kings were boosted by the return of Mahendra Singh Dhoni, who was out of action due to an elbow injury. India's captain was hit by a rising Shane Bond delivery on his elbow earlier in the tournament, after which he seemed to be in a bit of bother. Though initially he was scheduled to be out for ten days, he was back to action in just seven. Matthew Hayden and Parthiv Patel gave Chennai a great start. Hayden went after Zaheer Khan in the second over, hitting four boundaries in a row. The first four was a thick edge to thirdman followed by two more over the off-side cordon while the fourth narrowly missed the bowler before crashing into the long-off boundary. Parthiv Patel flicked McLaren over midwicket for his first boundary as Chennai raced to 31 from three overs. Just when Hayden looked at his dangerous best, Tendulkar brought in Harbhajan Singh and the move clicked immediately. Hayden called in for the mini Mongoose in the fourth over to push the run rate, but didn't last long; Harbhajan trapped him leg before wicket with the quicker delivery. The bat failed to come down in time and Hayden was struck right in front of the stumps after scoring 20 from 12 balls. At the other end, Ryan McLaren castled Parthiv Patel for eight runs. With Super Kings reduced to 38 for two, Suresh Raina was joined with S Badrinath and together they revived the innings. Raina ensured Mumbai didn't lose the momentum; he flicked a full delivery from Dwayne Bravo for a six over square leg. The left-hander followed that with a splendid cover drive for a boundary, piercing the gap to perfection, reducing the ring of fielders on the off-side to mere spectators. Raina went after Bravo again, in his third over; he hit the medium pacer for a six over midwicket and boundary through point. Raina finished unbeaten on a cracking innings of 83 from a mere 52 deliveries, having hit seven boundaries and three sixes. S Badrinath, who had come under lot of criticism for not being able to lift the tempo, played sensible cricket and lifted the tempo when required. Playing second fiddle to Raina, he got his first boundary off the 13th ball he faced when he tried to pull Lasith Malinga but got an edge that went into the boundary behind the wickets, in the 11th over. Having found his footing, he also looked to lift his scoring rate with boundaries in successive overs. After a slow start, Badrinath lifted the tempo in the final overs to score 55 from 45 balls, the two batsmen having added 142 runs in 91 deliveries for the third wicket, the second highest partnership in the IPL so far. Super Kings finished 180 for two wickets in the stipulated 20 overs. Chasing a competitive 181 for victory, Mumbai Indians openers Shikhar Dhawan and Sachin Tendulkar gave the team a fabulous start. Dhawan was the aggressor, hitting Albie Morkel for couple of boundaries. He then turned on the heat when Dhoni introduced medium pacer Joginder Sharma, hitting him three boundaries in his opening over. He then hit two consecutive sixes of Balaji in the very next over as Mumbai Indians got the important momentum. Shikhar Dhawan finally scored his fifty, with a towering six of left-arm spinner Shadab Jakati. However he fell in the same over when he chipped down the track, looking for the lofted hit, but miscued it towards midwicket where Raina held on. Sachin Tendulkar continued from where he left off against Kolkata Knight Riders and played calculated shots. Though a bit scratchy, he slowly accelerated at the right time, keeping them momentum going. So much was the class that he hit the 200th six off Muralitharan. But Chennai pulled things back a bit, when Saurabh Tiwary was trapped leg before wicket by Muralitharan for two and R Satish also failed with the bat, bowled by Joginder Sharma for five. 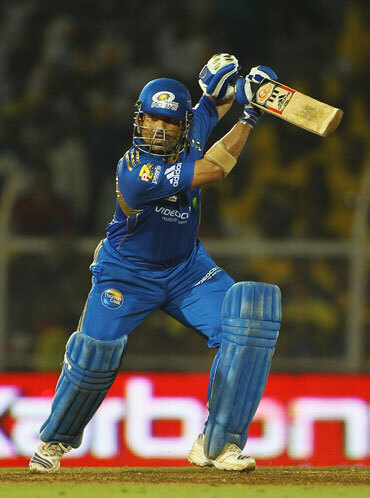 But a sensible innings from the Mumbai Indians skipper kept the team on course to victory. Tendulkar completed his half century when he flicked one to short fine-leg off Jakati. The Mumbai captain continued his good run of form with the bat, scoring 72 from 52 deliveries, hitting eight boundaries and a six, to guide his team to victory before falling in the final over. Mumbai cruised to 184 for five in 19 overs and won by five wickets with an over to spare. The victory took them to the top of the IPL standings.